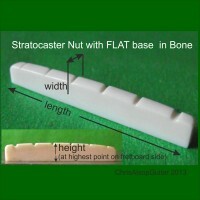 Bone Guitar Nuts made to your specifcation. 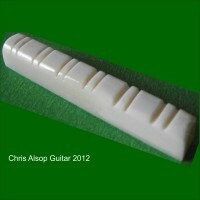 All guitar parts are designed and manufactures by Chris Alsop in his workshops in Derbyshire, United Kingdom. The nuts are hand made from high density bone. We make the parts using precision measurement, precision cutters with careful hand finishing and polishing. An accurate, high quality manufacture results. 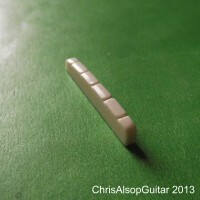 We often communicate closely with the buyer to make sure we get the right specification and you receive the full benefit of our knowledge of guitar nuts. 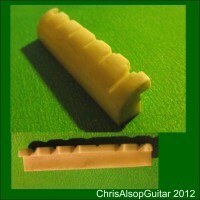 Bone Slotted Nut for 6 string Classical Guitar including Tailoring Material This nut is made fro.. 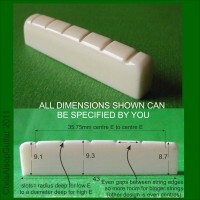 Bone Slotted Compensating Nut Material This nut is made from high density Ox bon..